For more than 50 years, Mil-Spec Packaging of Georgia has been providing expert assistance in the manufacture and design of full-service packaging. We offer contract and military-spec packaging, containerization, and export packaging for a wide range of applications. Whatever your specific shipping needs — whether you require custom wood crates, boxes, or containers — Mil-Spec Packaging can provide a solution to ensure your cargo arrives at its destination quickly and safely. Whether you’re looking to ship a tiny electrical component or a hulking jet wing, Mil-Spec Packaging will create a tailored shipping plan. Mil-Spec Packaging’s wood shipping containers — both panelboard boxes and cleated plywood boxes — meet all military and industry specifications. Wooden crates and containers that go overseas must be properly wood- and heat-treated, and Mil-Spec Packaging is proud to be a certified heat treating facility. We also hold a certification for wood stamping. Skids, wood boxes, and shipping crates are custom sized, shaped, and cushioned to protect your product during transport and storage. And to ensure the perfect fit, Mil-Spec Packaging can work from customer drawings and closely collaborate with clients throughout all steps of the process. All of our wood shipping containers are certifiable for export overseas, and we hold UN-HazMat and military specifications in accordance with ISPM 15. 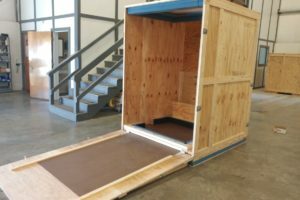 Our team also offers custom crating and pallet services; when a specialized shipping solution is required, Mil-Spec Packaging’s specialists will help in pinpointing the best option. The team also aids in determining the most appropriate design and materials for clients’ specific needs. Anything from airplane wings to computer equipment can be packaged in a way to allow for ultimate reliability and protection. And depending on the specific project, our team can provide packaging solutions down to just one single container. Specialty on-site crating and packaging are available as well. Having these tasks done in your own facility comes with a number of unique benefits. First, delicate instruments or equipment can be placed in protective barrier bags to reduce the risk of contamination. These sensitive parts receive adequate cushioning through the use of shock pallets and floater decks before being moved off-site. Plus, manufacturers can easily prove that the proper shipping precautions were taken. On-site crating and packaging are also very cost-efficient for our customers, since they don’t have to keep trained staff on their payroll, and don’t have to worry about the costs and logistics of moving large items. We make use of various types of pallets: wing, four-way, two-way reversible, two-way non-reversible, block, panel deck, and expendable. Available add-ons to further protect items include cellulose wadding, foam cushioning, bubble wrap, bound fiber, Vermiculite, and volatile corrosion inhibitor (VCI) packaging and bags. The team at Mil-Spec is committed to providing top-of-the-line packaging solutions for the export industry and is proud to retain a long list of repeat, loyal customers. All of our wooden shipping containers have a fast turnaround and are of the highest quality possible, at the fairest possible prices. And since we’re a one-stop shop — offering everything a company needs for a package, from the foam, the container, and even the label — customers can save both time and money on shipping. To learn more about how we can assist with your specific export needs, request a quote today.